Many of the problems associated with making an MMO, a Massively Multiplayer Online game, come in large part from the very first term: “Massively”. An MMO is notably tricky to build due to technical issues involving server scaling, as well as design issues involving scaling economics, politics, level design, pacing, persistence, and progression. A rule of thumb is that development costs grow exponentially as the number of players increases, but for many years, there’s been an unquestioned assumption that bigger player numbers are inherently better and therefore worth pursuing. Yet we see clear counterexamples. Many early MUDs (Multi-User Dungeons) involved populations of dozens-to-thousands of people and still have vibrant communities to this day . Multiplayer Minecraft is wildly successful, despite its reliance on relatively small, instanced servers. And many modern hit games, like Fortnite, are online games that successfully limit their focus to matches of 100 or less. What are the critical design lessons from these smaller online games—and how can current research and understanding of social psychology help make sense of those lessons? We combined our decades of experience designing social systems for online games and a deep dive into current academic research to arrive at a set of best practices and common pitfalls. When researching what it meant to make human-scale systems, we found several key concepts from social psychology. Each provides a set of constraints for social design. Social game design operates within the physical and mental constraints of the human animal, so it pays to understand these constraints and build them into our designs. A friendship is a single social bond between two people. Friendship formation is a distinct process involving proximity, similarity, reciprocity, and disclosure. An individual has a highly structured distribution of relationship bonds. 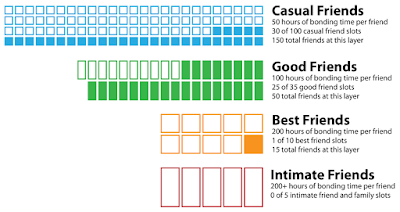 People tend to have a maximum of 150 total friendships , including 50 good friendships, which include 15 best friendships, which, in turn, include 5 intimate friendships. This web of relationships can be modeled as an egocentric network with the individual at the center. This paper focuses primarily on the implications of Dunbar’s Layers for human-scale social design in online games. A social group of is a collection of people brought together for a shared task or interest. Groups contain multiple overlapping individual networks. The performance of the group, as a whole, is dependent on how the friendship bonds across the entire group are leveraged to accomplish the shared activity. At the most basic level, human-scale game design is about creating strong relationship bonds between individuals. Most game populations will start out with weakly-bonded individuals. You’ll need to create activities, incentives, spaces, and social structures that actively build friendship in order to enable even the most basic of trust-based activities. This section is a brief overview. For more detailed discussion on this topic see the 2016 Project Horseshoe paper on game design for building friendships. Proximity. Being close together to one another encourages frequent serendipitous interactions. Similarity. Players will generally be more likely to become friends if they perceive one another to be similar. Reciprocity. Players must engage in escalating back-and-forth interactions in order to negotiate shared social norms. Disclosure. At higher levels of friendship, there needs to be an opportunity for safe, consensual, intimate sharing of weaknesses. You can take any two players, put them together in matches for hundreds of hours, and if the above criteria are not met, they are unlikely to become friends. Naively tossing bodies at one another is not efficient social design. Opening. A person performs an opening action that a second person observes. This action has a cost in terms of time, investment, skill, and other resources. For example, Player 1 asks a question in open chat, which costs time and social capital. Opportunity. An opportunity is created for the second person to respond. For example, Player 2 sees the question and can answer in the same chat. Response. The second person performs a responding action that acknowledges the first person. This also has a cost. For example, Player 2 offers an answer to the question in chat, which also costs time and social capital. Acknowledgement. The first person acknowledges the second’s response and the loop is now complete. For example, Player 1 thanks Player 2 for answering their question in open chat. Escalation. Either during the Response or the Acknowledgement stages of the loop, a person can escalate by opening up a new loop or prompting additional response. This is an opt-in act. For example, Player 1 asks for additional details. Rejection. Either during the Response or the Acknowledgement stage, a person can either not respond or respond inappropriately, which also collapses the loop. For example, Player 2 mocks Player 1 instead of answering their questions. Friendship is a long-term process. Each reciprocation loop may take seconds initially, but you need thousands of linked loops to build a robust friendship. Create low-cost loops with low rejection costs for early relations. Create higher-cost loops for later term relationships. Build space inside the later loops for expression and definition of the personal relationship between two players. For example, friendships in an MMO tend to start out with parallel play, where two people simply see one another’s name while fighting monsters in the same area. This then escalates to helping one another; a heal spell, an emote of celebration, a dropped item. The two players may start chatting in order to take down harder monsters; they may also friend one another and start talking more about who they are and what they are interested in. At each stage, interactions take increasing time and effort. And involve richer communication. Each micro-loop is not very expensive, but over long-term repetition of many such loops, the relationship accumulates meaningful amounts of trust. Design these systems with the same rigor, care, and eye for economic balance that you’d put towards a combat or progression system. Almost every stage of these reciprocation loops involves consent. Each party must consent to both starting, continuing, and escalating the relationship. At any point, it is totally fine for one or both parties to pull away, either to slow down or move onto some other relationship opportunity. In the context of Dunbar’s Layers, there’s a limit on the number of people an individual can have in their lives. The process of building friendship is also the active process of curating relationships that are healthy and mutually satisfying. When players actively and enthusiastically consent to engage in your reciprocation loops, you’ll find that the relationships you build in your game are more authentic, last longer, and ultimately provide more value to your players. An individual organizes their friendships by strength of their one-to-one bonds. They have close friends they turn to in times of crisis and more casual friends, with whom they interact with less frequently. Social psychology has been studying these friendship networks for decades. 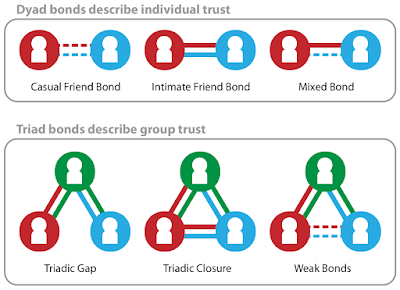 One of the more reproducible findings is the existence of strong limits on the number and strength of bonds an individual can have with other humans. Robin Dunbar is an anthropologist who, in the 1980s, posited that a human can have up to 150 meaningful relationships, based off his investigations into primate social brain structures . When others attempted to verify this prediction, they found that “Dunbar’s Number” kept coming up in long-lasting groups in the real world. It’s been replicated across a huge number of domains including businesses, religious organizations, military groups, and, of course, MMO guilds. However, as researchers dug further into the data, they noticed additional stable clustering at lower numbers of connections. These smaller clusters were part of a person’s total of 150 relationships, but involved much stronger bonds. Visualization of Dunbar’s Layers. Each block represents time to build one relationship in that layer. 1.5 people: The intimate couple or the individual. 5 people: Intimate friends or family. People you can call in a crisis. 15 people: Best friends. People who you can ask for sympathy. 50 people: Good friends. The majority of regular social contacts and, by extension, all of one’s emotional and economic support . 150 people: Casual friends or acquaintances. Note that each layer is cumulative and contains the previous layers, so your best friend layer contains your intimate friends layer as well. A common confusion is to think you have 5 intimate friends AND an additional 15 best friends, etc., but those 5 intimate friends are part of your 15 best friends budget. These numbers are averages and, in reality, describe tight ranges. In practice, different people have different degrees of social needs and relationship-building capacity. For example, many men average 3-4 relationships that they would consider intimate friends or family, while many women average 7-9 such relationships. Some people, known as “super-connectors,” have upward of 200–250 meaningful friendships. With larger data sets, we’ve discovered these relationships layers also extend past actual friends. 1500 people: You recognize their face, but that’s it. 2000 faces seems to be the absolute maximum that a human can recognize and when you learn a new face, you drop one of the other faces you’ve memorized. On first glance, Dunbar’s Layers are a mere curiosity. However, they fundamentally shape how people socialize. The following are aspects of Dunbar’s Layers worth knowing about before you attempt to use them in a design. Visualizing the innermost Dunbar’s Layers as an egocentric network. Note all connections are from the perspective of a single individual. Put a given individual at the center of a nodal network. Then map out bonds going directly to that individual. You’ll end up with an average of 150 meaningful relationships connected to the individual. Some bonds between the individual and their friends will be stronger than others. These bonds map onto Dunbar’s Layers. For example, a person will have an average of five strong bonds. Dyads: The relationship between any two individuals involves two connections, not one. Each person has their own perception of the connection’s strength. It is possible—and, in fact, common —for these perceptions to be unequal. Triads: Friendship networks can be analyzed by looking for triads—groupings of three people with at least two relationships between them. The strongest network structure is a “Triadic Closure,” wherein all three three individuals share mutual friendship bonds of equal strength. Strong Ties: When a person has a direct relationship with another person, it is known as a strong bond. Strong bonds are key to meaningful relationships, support networks and overall happiness. Weak Ties: When a person’s friend has a relationship with another person, but the original person does not, it is known as a weak bond. 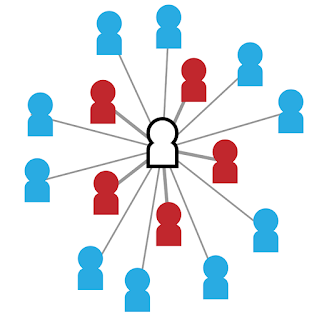 Weak ties are critical to connecting independent social groups and are particularly important for the functioning of large scale economic and informational systems. Weak ties also populate the 500 and 1500 person layers. When we start discussing social groups, weak ties become a very important concept. Super-connectors: Some individuals have substantially more than the the typical number of connections. Known as “super-connectors,” they end up acting as hubs that connect disparate friend networks together. Overall, having a deep friend network has an immensely positive impact on your health and happiness. Lack of friendship reduces lifespan . High quality, high intensity relationships are positively correlated with increased life satisfaction . Depression is lower overall in individuals with rich friend networks . On the flip side, toxic relationships have an outsized negative impact on mental and physical health. Something to think about when we deal with trolls in our games . Building friendships takes many hours of interaction. If you meet with someone for 1 hour each week, it will take roughly a year before you consider one another even casual friends. Friendship formation is not a cheap activity. Maintaining relationships takes less effort. Three key variables here are kinship, gender and frequency of interaction. Kin bonds (bonds with family members) require less maintenance than non-family friendship bonds and do not seem affected by distance. Men tend to affirm bonds by participating in activities together, while women tend to talk with another. Higher strength bonds needs more frequent renewal than lower strength bonds. Casual friends meet up at least once a year. Good friends meetup up once every 6 months. Best friends meet up once a month. Intimate friends meet up at least once a week. One way of thinking about the constraints suggested by Dunbar’s Layers is to imagine you have a budget of cognitive resources that can be spent on relationships. The physical limits of your human brain mean that you only have enough mental budget for a total of roughly 150 relationships. Humans have developed a few tools that have expanded our ability to organize into groups well past our primate cousins—most notably language—but also large-scale systems of government and economics. In the early 2000s, people assumed that new technologies like online social networks could help break past Dunbar’s Number; by offloading the cost of remembering our friendships to a computer, we could live richer, more social lives, with strong relationships to even more people. We now have copious data that this is not the case. Studies suggest that there’s still a limited budget of cognitive resources at play and even in online platforms we see the exact same distribution of relationships . If anything, social networks damage our relationships. By making it possible for us to cheaply form superficial relationships (and invest our limited energy in maintaining them), such systems divert cognitive resources from smaller, intimate groups out towards larger, less-intimate groups. The result is that key relationships with best friends and loved ones suffer. And, unfortunately, it is the strength of these high-trust relationships that are most predictive of mental health and overall happiness . A social group is a set of individuals labeled as being in a group. This is inherently a fuzzy concept, since the true structure thereof is an overlapping network of egocentric networks, partially-negotiated social norms, and ever-shifting relationship bonds. There are three dominant perspectives on what makes a group. Social Identity perspective: “I feel like I’m part of a group.” An individual can self-identify if they are part of a group. By doing so, they start practicing the social norms of the identified group. This is the perspective that gives birth to either imposter syndrome or a feeling of belonging. Self-categorization perspective: “I feel like you are part of a group.” Someone looking at the behavior of other people can identify if others are behaving as part of a group. By doing so, they treat those people as if they operate using shared social norms. This is the perspective that gives birth to stereotypes. Shared goals. Are we working towards the same purpose? Status relationships. Who has power? Norms. How do we work together? Sanctions. What happens when norms are violated? Group size. How many people are in the group? Group trust. How strong are the bonds between individuals in the group? Group stability. Does the group come together for a short period of time or is it a stable, persistent entity? The social cohesion perspective proves the most design insight, so we’ll be referencing it for the rest of this discussion. Common groups sizes roughly align with Dunbar’s Layers. However, these are not identical concepts. Social groups can contain friends of varying trust levels. You could have a small group composed entirely of strangers. whereas a 5-person intimate friends layer is, by definition, an individual’s closest set of friends. These are some of the most common task-oriented groups to form. Non-kin, task-focused groups of these sizes often dissipate when the task is complete. Small groups are, however, able to attain the highest strength of social bonds, usually focused on key family relationships. These are the largest-possible friend groups. Example groups at these sizes include a guild, shard, or map in an MMO, a mid-sized company, or a social organization in a university. These larger groups are composed of smaller friend-based sub-groups. However, due to their size being larger than Dunbar’s Number, it is impossible for them to engage in very high-trust activities without additional systems like hierarchy, reliance on weak ties, or codified rules. Group trust, much like friendship, forms according to a process that imposes constraints on any social design. When we matchmake a set of random players together, we first get a low-intimacy, low-trust group of strangers. We then need to take that group through a period of social norm formation and relationship building. This process creates a rich, highly predictive social contract between individuals, which enables people to depend on one another in dynamic group activities. Forming: The group is brought together. Performing: The group is able to perform higher-dependency tasks by leveraging their newly developers rules for interacting. Existing strong bonds can facilitate group norming. If there are existing friends, they’ve already negotiated a set of common norms between them. This is a foundation to build upon when deciding the group’s shared goal and social contract. Small groups need to build fewer bonds in order to perform at high levels. You can think of the norming process as one where people negotiate some minimum level of triadic bonds between all members of the group. With smaller groups, there are fewer connections, so the process goes more quickly. Larger groups naturally have fewer intimate bonds. When dealing with people in the outer layers of our network, we rely more strongly on official rules, rigid social norms, and other forms of bureaucracy. People stop trusting the individual and instead lean upon a system of governance. This is less efficient, in general, due to the cost of maintaining the system, but lets more people participate. Mentoring. People often obtain high levels of competence through interaction with a coach or mentor. Finding ways to incentivize groups to adopt lower-skill members in order to train them up will benefit both group cohesion and general communal friendliness. Slower integration. If facilities are not provided for subdividing groups at this layer in to smaller groupings, then every new member must be inducted by introducing them into a central communication channel. This greatly reduces the chances for the new member’s retention in the group, as they must form relationships with everyone at once, rather than being adopted by a segment of the organization and then extending their relationship network outward from that solid foundation. The best groups at this size and above have clear 15-ish person clusters, which are an ideal size for integrating a new member. Primary groups. Long-lasting groups of family and friends. They tend to have strong bonds and a shared sense of purpose. People usually only belong to a few primary groups corresponding with their inner Dunbar’s Layers. Secondary groups. Temporary, task-focused groups. These can be large or small. People often belong to many secondary groups corresponding to their outer Dunbar’s layers. It is important to allow people to join (and leave) multiple secondary groups, as they need. Even through group size and Dunbar’s Layers are very different concepts, they do seem to be related. Small groups are stable at around 5 people, primarily due to their heavily reliance on long-lasting family relationships. Large group sizes tend to stabilize around the 50, 150, 500, and 1500 values found in Dunbar’s Layers. Growth: Groups below 150 tend to grow to that size. Fission: Groups above 150 tend to fragment into sub-groups of 150 or less. Groups at 50 and 150 find long term stability, often measured in years, by benefiting from peer pressure (norm reward and censure), without the need for complex rules and hierarchy. The stronger the sense of shared purpose, the more robust the group. There’s more research to be done here, but this seems to be the maximum group size where, due to the limits of Dunbar’s Layers, you can rely on unaugmented human nature to self-organize into stable groups. Stable groups at 500 and 1500 are far rarer because they require the addition of some from of hierarchy in order to be sustainable. Usually this involves appointing a small group of 4-5 decision makers who represent other 50 to 150 member sub-groups. These decision makers represent ‘weak ties’ between groups. Weak ties are key to the stability of 500 and 1500 player groups. They let a group of 50-150 reach out to other groups and quickly gain access to resources, opportunities, and information. Studies show having a diverse set of weak ties -- particularly in a large community of uncaring strangers -- increases life satisfaction. 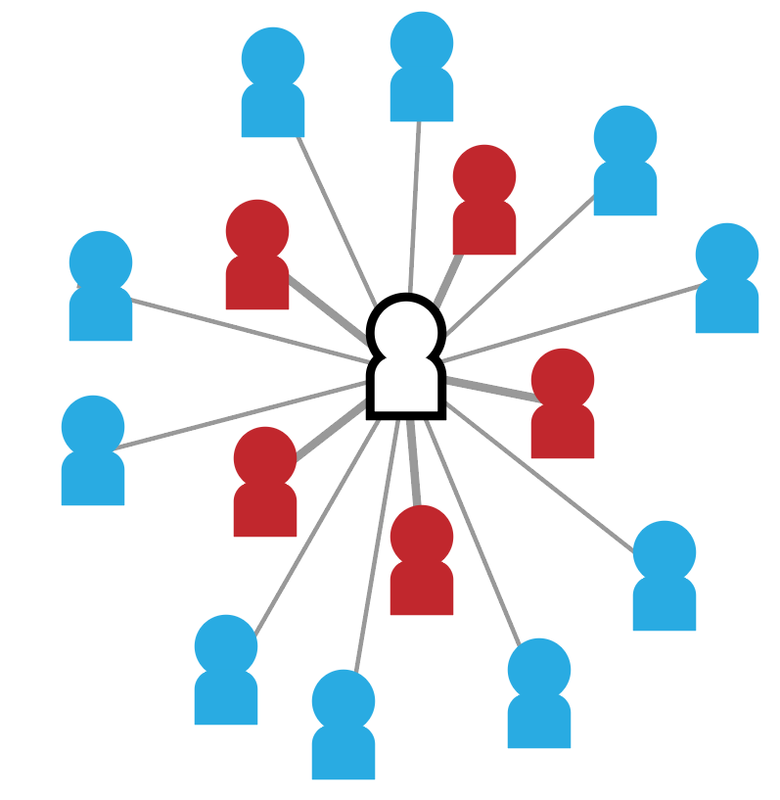 Weak ties are not universally good for game developers. Scope creep. The economic and political systems necessary to make very large groups function are often some of the most complex features in a game. To support weak ties in your game is to accept a certain level of scope creep. Over emphasis on weak ties can hurt strong ties. Weak ties are also not a replacement for strong ties. Social groups involving mostly weak ties are poor at providing emotional support as well as transferring and enforcing group norms. Many critiques of strongly capitalist, technocratic or libertarian dystopias center on how a overreliance on weak ties (via large-scale trade, algorithmic replacement of reciprocation loops, and other scaleable-yet-dehumanized systems) leads to an accidental erosion of strong ties. If anything, modern MMOs suffer from too many weak ties and not enough emphasis on building and supporting strong ties. Perhaps because MUDs and early online games were historically rich with strong bonds, MMO designers simply assumed they’d get those for free. They didn’t realize their desire to build a big game—which historically has been conflated with popularity—was antithetical to the magical social connections that made early online games attractive in the first place. Shared goals are the single strongest predictor of group cohesion. Groups with more group pride and stronger task commitment have strong shared goals. They are most likely to perform well at high-trust tasks, and have high retention, longevity, and increased sense of member well-being. Members with strong group pride feel strong allegiance to the group, are happy with what the group accomplishes, and promote the group identity to others. Group pride is expressed in the same fashion across different group sizes, but identity becomes more formalized as group size increases. Weak identity. Small friend groups may not have an official identity, and many of their positive feelings come from mutual support. Official identity. Large social groups have official identities and a strong sense of membership. When people are part of a high-performance group, they feel like they are part of something bigger than themselves, which can lead to a sense of awe. Stereotype-based identities. At the huge impersonal scale, we see strong tribal identities and stereotypes. People build simple cartoon models of how other people should respond to interactions. Splitting people into in-group members and out-group members occurs relatively quickly, using only superficial information. Tactical tasks. Small secondary groups understand their purpose in terms of short term tactical tasks. This could be completing a small project or finishing an ad-hoc raid together. Small primary groups are usually focused on supporting one another. Trying to sustain the group. Large social groups are focused on bigger topics like long-term survival or sustaining a community that upholds shared beliefs. Group vs group superiority is an interesting task at this scale, especially for groups composed largely of young men. Part of an ecosystem. Huge impersonal groups are brought together by convenience. They share a common set of codified practices involving trade, language, and practices that help their smaller friend groups accomplish desired goals. The task commitment present at this level usually involves maintenance of support systems such as political or economic structures. Share goals, not just shared rewards. Many game designers assume that if there is a shared reward, people will naturally align their activities. This might work if humans were hyper-rational, profit-maximizing automatons, but they are not. Instead, players benefit from clearly-stated goals and examples of how they might work together. Public and private spaces. Large social groups are composed of sub-groups that require private space to reinforce vision and social norms as well as create opportunities for group bonding. They also need public space to display and reinforce the group’s overall identity. Group vs. group content. Conflict with other groups is a common method of providing a shared purpose. Meaningful rivalries can play out over the course of months or years. Games with PvP content can create very rich social histories if they can operate at this scale. Positive goals involving growth and support. Though it is easy to rely on competition in order to give your group a purpose, history is rich with high-longevity groups, usually in the form of religious communities, that exist to preserve a positive way of life. Consider how your game can be a positive refuge from the broader world. Many players will find this to be a worthy goal to dedicated their time toward. Every group needs to agree on roles within society. These are composed of appropriate division of labor and division of resources. Specialization increases with group size. Overlapping roles. In small friend groups, there’s substantial overlap in roles, with a single individual performing many different activities on an as-needed basis. Cross-training and a lack of specialization is quite common. On high-trust tasks, there’s heavy interdependency and the loss of any individual is sorely felt by everyone. Specialization. In large social groups, we start to see specialization where individuals take on specific roles. Secondary groups focused on specialized tasks are common and people belong to multiple of them. An individual may train in several roles and perform one role for each secondary group. Jobs become identities. Huge impersonal groups see the emergence of jobs and classes. A person has one dominant job they do in a hyper-specialized economy, which becomes their formal identity within a broader, rule-based society. They are a crafter, or a teacher, or a doctor, and nothing else. Economic complexity increases with group size. Communal sharing. With small friend groups, resources are often communal in nature with substantial gifting and untracked sharing. Social currency and interpersonal trust are more important to transactions than currency. Value-based barter. In large social groups more formalized 1-to-1 trade in the form of barter appears. There may be a local currency and individuals keep close track that each trade is of equitable value. Complex economic networks. In huge impersonal groups, both labor and resources are traded within an economic network with markets and auctions. Trade is strongly depersonalized, with every interaction based off a standardized currency. This network is heavily dependent on weak ties and super-connectors—people who can maintain more than 150 meaningful connections—play an outsized role in keeping various sub-groups together. Status and hierarchy start out relatively undefined in smaller groups and grow in complexity with group size. Leaders become more important and less personal in larger groups. Context-specific leader. Small friend groups often end up electing a de facto leader, consciously or subconsciously, who is best-suited for the task at hand. Groups this size should be encouraged to designate a leader/organizer who can help keep the members focused on their shared purpose. Cult of personality. Large social groups require leaders. Synchronization of activity becomes immensely difficult without a central authority wrangling the various sub-groups to move in an aligned direction. At this size, leadership is largely a “cult of personality,” driven by personal relationships instead of institutional power. Symbolic leaders. Huge impersonal groups use ceremonial leadership, where the leader is a concrete, personified symbol of shared purpose, allegiance, and/or cultural values. There are a variety of related techniques including the use of celebrity, figurehead leaders, religious characters, or heroic individuals. These establish a type of group known as a reference group, which individuals look to when determining which social norms to emulate. Hierarchy becomes increasingly necessary as group size increases. Fluid. Small friend group organization is fluid and often depends on the best person for the task at hand stepping up. Activity related sub-groups. Large social groups show visible hierarchy composed of a few primary groups and a number of task-focused secondary groups. We begin to see multiple 5 and 15 person groups operating inside groups of this larger layer. Complex hierarchies: Huge impersonal groups have complex official hierarchies. Groups need official political and economic relationships in order to function. Tools for status signaling. The ability to signal hierarchy and status help larger organizations function. Titles, karma points, and visual flare are all systems that allow status to be earned and displayed. Official reputation tracking. For huge impersonal groups, we see the emergence of strong anonymity, reputation starts to be more important than actual skill competence and parity. At the 500 person layer, freeloaders and bad actors can more easily slip through the cracks, so official means of keeping tabs on someone’s reputation benefits group cohesion. Norm formation in social groups involves how a group determines the rules they operate by and how they communicate those rules. Rule formation becomes increasingly formalized as group size increases. Personally negotiated norms. Small friend groups negotiate rules on a one-to-one basis, usually through small group discussions. Often behavior is determined on a case-by-case basis depending on the person and the context. Key decision makers. Large social groups follow the behavior of high-status individuals or leaders. One or more smaller, high-status groups make decision through consensus-building and then then share those decisions with lower-status individuals. In more equitable groups, simple voting systems appear. Public rules. Huge impersonal groups use official legislative systems for setting or revising laws. They usually have formalized community feedback mechanisms. At this stage we see strong rule of law. In more organized groups, explicit rules become prevalent. By requiring that people work in a very specific, codified fashion, you remove uncertainty and increase the group’s ability to function. You’ve replaced the slow process of negotiating social norms, through in-person reciprocation loops, with rules that simply tell you how you should act. However, this comes with substantial downsides. These rules are inherently less flexible. They need to be written up, conveyed, and enforced. If the situation for such a group changes slightly, the existing rules may actually reduce efficiency. And there’s no real trust—all parties execute on a pattern and hope it works. Communication shifts from reciprocation loops to broadcast as group size increases. Personal conversation. Small friend group members will communicate frequently and in depth with all other members of the group. This communication is likely to be equally spread between all members and structured as peer communication. Tiered communication channels. Large social groups have multiple tiered communication channels. There generally needs to be an open, shared channel; a one-way broadcasting channel from leadership; and a number of sub-group channels for specific primary and secondary groups. Broadcast communication. In huge impersonal groups, personal communication simply cannot reach all the people in the many sub-groups, so these groups must use broadcast technologies to send one message to many people cheaply. This, in turn, enables propaganda, where various parties use broadcast media to push unquestioned messages that promote new truths. There’s no consent loop for someone to provide a contradictory response. This is useful for spreading new social norms about how one should behave or for emphasizing group bonds, but cartoon symbols of complex systems end up being easier to spread than deep understanding. What happens when norms are violated? Personal disagreements. Small groups are constantly negotiating norms. Norm violations are typically confronted in small group conversation, one-on-one or with the whole group, and are essentially arguments. Withdrawal from the group. In extreme cases, members of small groups will stop talking to someone with whom they have a personal disagreement, or the group will distance themselves from an individual by lowering the frequency of interaction with them. Cliques and bullies. Groups this size can form into abusive groups of bullies. Designing for groups this size means added community management. Groups of this size rely on vision-based leadership, which can allow hate groups and other fear-based organizations to fester. Demonizing outgroups. It is common for very large groups to explicitly label those who are enemies of the tribe. This is less about attacking the outgroup and more about focusing the larger group on a larger shared goal. The downside to this is it usually relies on fear, which short-circuits more thoughtful and constructive group coordination patterns. Law enforcement. Tracking down those who break the laws and determining the best way to change their behavior is a feature of very large groups. Economic scams. Groups emerge that profit from preying on people who want to get an economic edge. Various black market scams start to be common, like account and credit card theft. Outside groups target the community. Organized griefing. Though individual griefers exist in smaller groups, within a larger population, a griefing tribe can satisfy all of an individual's social needs. Griefing becomes the social norm for such people and there’s no leverage at any point in the network to deprogram a griefer. This can lead to all-out wars, where one group attempts to destroy, alienate, or otherwise expel a rival group. Account manipulation. With a large number of strangers, it’s hard to track who is coming or going. In online games, people create extra accounts and use them for botting, muling, multi-boxing, and other techniques that are otherwise easily trackable in more intimate settings. Internal corruption. As with nations, if a game becomes big enough, it is easy for moderators and community management to surreptitiously misuse their powers. 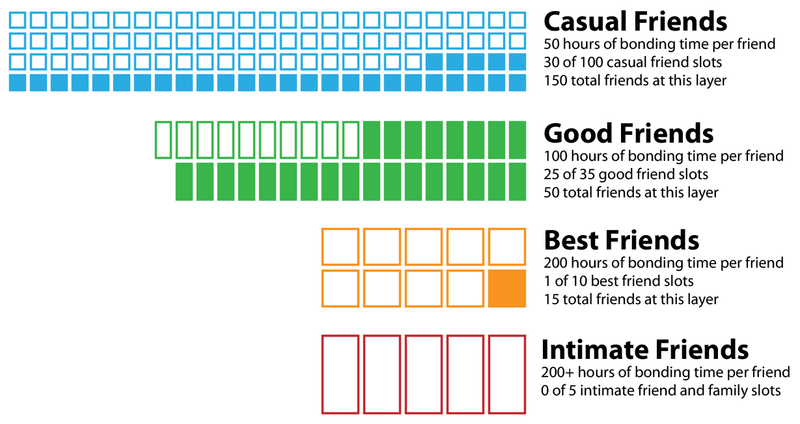 Considering the constraints imposed by friendships, Dunbar’s Layers, and social groups, it is worth exploring game design that is centered around natural human social scales. Human-scale design is social design that targets the 5, 15, 50 and 150 person egocentric networks and associated groups. It explicitly avoids player systems involving 500 or more players. If you can build a human-scale game that enables a player to spend quality time with good friends, you’ll likely improve the quality of their life. While if you break these hard limits, you actively damage your game’s social systems. These social psychology models should do more than just inform our evaluation of game systems—they should be actively shaping the way we approach design. Such an approach focuses on smaller, more intimate social design as the core of a game. It is less concerned with big numbers and infinitely scalable systems, and more interested in fostering trust and connection between players. This perspective led us to some fundamental insights concerning how we approach online game design. As a result, the final systems are often surprisingly complex. You’ve jumped directly into designing systems that need to handle the many issues associated with 500+ groups (i.e., your player population). Immediately, you are faced with the key problem that your world is just a large, empty area where a player sporadically meets strangers they don’t trust. As conflict inevitably arises from these low-trust interactions, the dev team toils to add a vast amount of bureaucracy to manage the poor player experience. It can feel like patching unending leaks in a poorly-placed dam. In the best cases, like EVE Online, players create their own systems of crude governance to shore up the faulty social design. But for the majority of games, we see outcomes like The Sims Online, where mob-style groups grief new players and chase them from the game. Define social activities. First, imagine activities/content/context for players to enjoy together. For example, you might prototype cooperative raid mechanics for a PvE MMO. Map out group sizes and trust level. Then, figure out what group sizes and levels of friendship best fit those activities. High-trust activities should be reserved for small groups of close friends in the 5, 15 and 50 layers. Low-trust activities can work for groups up to 150 in size, but not beyond. In fact, explicitly remove activities that involve more than 150 people. For our MMO example, you take your raid prototype and map out variations of the raid that are suited for high-trust small groups, low-trust small groups, and low-trust large groups. Build appropriate social support systems. Build systems that support the right activity for the right group size. With the MMO, you realize that your high-trust small group encounter needs high-bandwidth communication channels to execute, so you add voice chat or rich emotes—two possible communication channels that support and enable group performance. Scale the activity based off quality and quantity of friends available. Finally, organize the activities/content so that player groups can organically scale up and down. In the MMO example, a single player might be present and you’ll want to serve them up low-dependency, small-group content. But if a stranger appears, consider how the game might switch to a low-trust activity with parallel play? If several friends appear, how would the activity allow them to opt-in to a higher-trust (and higher-reward!) challenge? This approach has the advantage of more closely mapping to how humans have grouped historically: in nested layers of families, tribes, villages, etc. Sticking closer to the natural shape of social grouping will make your group activities feel more familiar and facilitate social bonding. It will also allow you to apply lessons and best practices from psychology and anthropology more directly. When game designers think of retention, we often first consider User Experience (UX). Using the logic of UX, if a developer builds a complicated core interaction that is difficult for a player to understand, most players will churn out early on. Such games should have poor early retention and struggle with new player acquisition. However, the game industry has many counterexamples. Dwarf Fortress, Go Pets, and Dofus are three games renowned for their poor user experiences. They have weak tutorials, byzantine gameplay loops, and a general lack of traditional first-time user experience polish. By all traditional UX values, they should be failures, yet they are not. While these games have poor UX, they also have strong social design. For example, Dofus is a game that is specifically popular in France. Its developers tried to expand its reach to other countries with limited success, for many of the aforementioned reasons. What made France special for Dofus? Cultural event. When Dofus first launched, French-language MMOs were rare and early adopters were blown away by the novel experience. Basic virality failed. Players actively proselytized the game to friends, but their friends weren’t able to play as the game was too difficult to learn. High-cost transmission to close friends. So players went over to their friends’ houses, helped them install the game, and spent hours teaching them, in person, the nuances of how to play. This was not intentional, but the result was that Dofus ended up being played predominantly by friends, many of whom were already part of each others’ 50, 15, and 5 person layers. This allowed players to build groups stocked up with high-trust compatriots and overcome the high-trust activities in the game. Succeeding at those challenging activities in groups of trusted friends gave the game incredibly high engagement. A virtuous cycle occurs where strongly-bonded friends make a game their homebase—a safe, intimate space for acting out their friendship. In turn, those players recruit more of their friend networks into the game. We’ve observed a similar process in other poor-UX, high-retention game examples. To be clear—poor UX is not the root driver for these games’ avid, high-trust communities. Instead, it is one of many pragmatic reasons for players to bring the inner circles of their friend networks into a game. Mismatched reciprocation loop costs. Incentivized by these games, players made a low-cost overture to a friend or associate (an invitation) that required a high-cost response (registering for, and playing, the game). This is a huge no-no when acting out reciprocation loops; it actively damages a relationship by suggesting you are ready to extract value from your friend instead of building toward future shared need. That is to say, it annoys your friends and makes them question the value your relationship. Dilution of community trust. Second, it brings low-trust people into the game. Because Facebook didn’t care about Dunbar’s Layers, especially in the early days of the social gaming boom, many users had social graphs with hundreds of “friends,” many of whom were no better than strangers. The low-cost overture to join was little better than a random spam ad and brought many of those random players into the game, diluting the level of trust for the community already inside the game. In one fell swoop, this greedy practice hurt retention, engagement, and future growth. All of these examples highlight the basic truth that social design is deeply powerful, but is often not a first-order consideration for designers. A very common confusion that came up many times during our discussions was the difference between friends, Dunbar’s Layers, group size, and concurrency (the number of players simultaneously logged in). These are all four distinctly different concepts, yet it is common for social designers to use them interchangeably. Much of this is the fault of our existing terminology. When we talk about multiplayer games, a common shorthand is to say, “It’s a 16-player game.” We all know that this means there are 16 concurrent players in a match or room, but we often erroneously assume that this also means they are all friends and/or that they are all part of the same social group. Both of these errors are a naive misunderstanding. Concurrent players can be spread across multiple types of social groups. Some of them might be members of groups that are antagonistic to other sub-groups in the game. Some are members of multiple groups. Some form small sub-groups while others form large sub-groups. They can have a mix of friendship bonds. Some of them may be friends. Most are likely total strangers. In general, having 16 people online together says almost nothing about whether or not they are in a group, or what the strength of their relationships might be. It is tempting to fall back on old, inexact language, but your game will suffer. Instead, teach your design teams about friendship formation, constraints on types of friendship, trade-offs involved at different groups sizes, and the logistics of social play. The structure of Dunbar’s Layers gives us insight into how many friends of a given trust level you can expect a player to have online at any particular time. There are logistical implications for matchmaking, events, and more. You design a high-trust activity that requires 100 people. But we know from Dunbar’s Layers that any human being will only have a maximum of 15 people in their life that have this particular level of trust. You’ve created a logistics mismatch that will results in inevitable failure. And you didn’t even have to build the game, launch it into the market, and watch it fail. You just saved your team millions of dollars and years of their life! Share of Social Time is the percentage of a player’s total time spent socializing that is spent inside your game. This corresponds roughly to the percentage of a player’s social graph that is active in the game. If a player spends 50% of their social time in a game, we’d expect roughly 50% of their friend network is also in the game. There are a couple ways of calculating this. Conservatively, we know from time-usage studies that the average American has approximately 5 hours of leisure time per day . 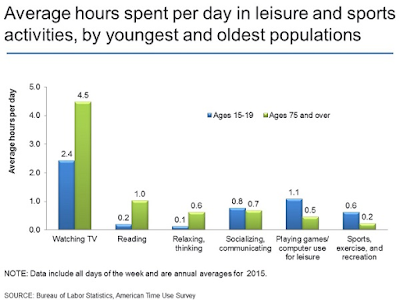 From this perspective, Share of Social Time equals Hours per Day Spent In Game / 5 hours. However, less conservatively, we know that people tend to spend approximately 0.65 hours per day actually socializing. This is likely an underestimate since the time-usage studies don’t measure time spent socializing at work. Nor do they consider time spent in playing games  as socializing. For the following calculations, we’ll use the conservative definition of Share of Social Time. For comparison, the heaviest players of Fortnite, around 8% of the player population, spend 3+ hours playing per day. 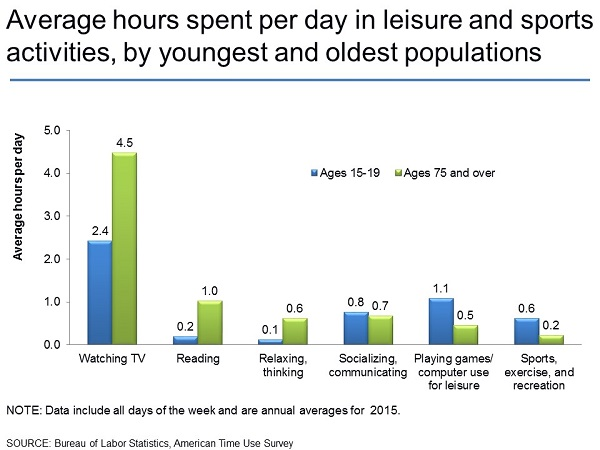 That’s roughly 60% (or more) of an average American’s total leisure time. Concurrency ratio is the ratio of monthly active players (MAU) to those currently online. Since synchronous activities require people to be present, it does us no good if you have friends in a game, but they aren’t actually playing. A highly-social MMO will have a concurrency ratio of 10:1, so for every 10 MAU you’ll have 1 of those players online. An international phenomenon like Fortnite enjoys a 20:1 ratio, while many web-games are as low as 150:1 or 250:1. Dunbar’s Layers suggests that our relationships map onto a very specific frequency distribution of friends. Long-term engagement. First, our game is a long-term activity which has been going on long enough that inner layers like intimate friends or best friends have grown in the game or have integrated pre-existing, external friendships. 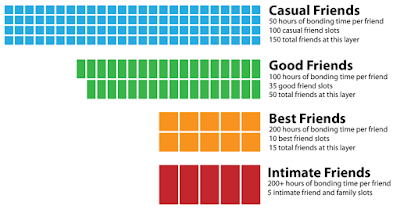 If a game is new or people have been playing for less than 200 total hours , you’ll see this distribution shift towards casual friends and strangers. Sufficiently large cohort. The total population of monthly active players is at least 1500. Support for all layers. If your game doesn’t have all appropriate social mechanisms for any given layer—such as the need at the 5 person layer for private locations/communication to facilitate safe disclosure—that layer will be less represented. We can use Share of Social Time, Concurrency, and distribution of friends to calculate some useful information about our game. How many friends will be in the player’s friend list? Given the standard distribution of friends, 50% of that player’s social network will be present in your game. With a total of 150 friends that means there will be 75 friends playing the game. How many friends will be online right now? Of those 75 friends in the game, due to the concurrency ratio, only 10% (7.5 friends) will be on at any point in time, on average. This sort of calculation puts much harder constraints on the types of activities that we can build into our game. Note that this is a best-case scenario. A highly-social MMO with great concurrency, and a player with a fully-engaged friend network. In this best-case situation you are lucky to get a single good friend playing alongside you. You will however get a few casual friends. This suggests that the core activity of even highly-social games with long-term, highly-invested players should predominantly be target low-to-moderate trust activities involving 5-7 players. What does this distribution look like at different cohort sizes? Using the same logic, you can see what friend distributions would look like at various fixed populations of active players. 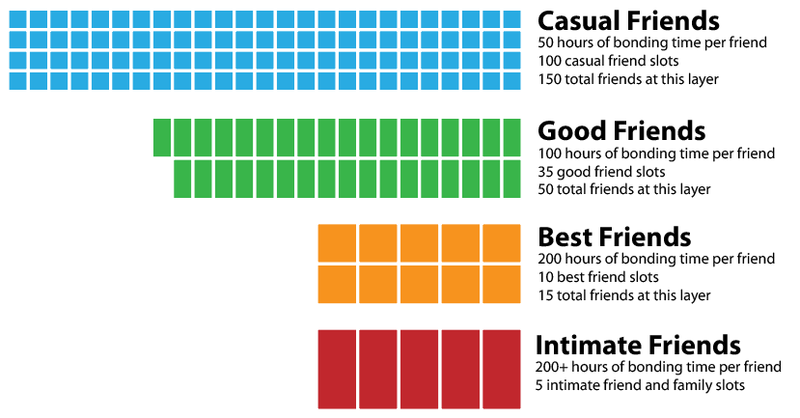 Chart 2: Max and Average number of friends an individual will have for various cohort sizes in a game with 50% share of social time and 10:1 concurrency. Due to the logistics of concurrency ratios and Share of Social Time, we max out the number of friends online at around 1500 people in a cohort. Simply having bigger cohorts doesn’t improve friend concurrency. How can we improve these numbers? The previous calculations are just an average of the sort of friends you can expect online. By shiftings a few variables around, we can create much higher densities of friends. Events. A timed event or a scheduled boss raid spikes the number of people online and can dramatically reduce the concurrency ratio. If you can drop the concurrency ratio to 2:1 with an event, then you have upwards of 12 friends and 4 good friends playing. This shift is one reason why events like boss raids can be high-trust events. Asynchronous Activities. Activities that people can do when others are offline allow for more people to be involved. Some asynchronous activities can reduce the concurrency ratio to the equivalent of 1. These systems have the downside of dramatically slowing down reciprocation loops by reducing communication bandwidth, so building out a full friendship network may take longer for players. Recruitment. Given the low engagement of the innermost friendship layers due to simple logistics, it is unwise to rely on close friends naively playing the game together. Invest in systems that actively encourage players to play with loved ones. Give them tools for scheduling these activities. In particular, social design benefits from using the internal economy perspective, where relationships are modeled as resources and transformations on those resources. Each relationship between two individuals is a pool. A pool is a container that accumulates resource tokens. Successfully completed reciprocation loops is a source that produces a resource called social capital that accumulates in each relationship pool. Rejected or unequal reciprocation loops are a sink that depletes social capital. As does distance and lack of contact over time. Dunbar’s Layers act as a cap on the maximum number of each level of relationship you might have. When a relationship pool fills up in one of the outer layers, it may transform into a new pool in one of the inner layers. However if the inner layers are full, one must give. If any of the layers are empty, the player seeks actions that fill them. This paints the process as rather cold and transactional. In practice, this type of design drives intense emotions. Losses of social capital yield strong negative emotions, while gains generate positive emotions. Rate of lose or gain will dramatically intensify the emotional response. If your goal is to make players laugh, cry, or otherwise experience the peak of what it means to be human, build strong social systems. When we develop a game that involves group sizes of 500 and 1500 people, we’ve created populations beyond the human brain’s ability to understand other people through personal relationships. Our players know nothing about most other individuals, as they are incapable of building a large-enough social network to understand the whole. Instead, they must rely heavily on rules and heuristics to govern their interactions, and we, as game designers, are on on the hook to provide those structures. By simply upping the size of our community, we’ve introduced an immense design challenge. We now need to build systems to manage crime, corruption, economic complexity, classism, racism, and more. Suddenly, our games exhibit most of the ills of modern society and the burden is fully upon us to solve them. If we don’t conscientiously address these issues, our community collapses into a hellish online dystopia. Consider building communities of 50–150 players. This will maximally leverage strong bonds for retention and engagement. Use instancing to ensure that your game can support a massive population even though each community is self-contained. Games like Minecraft; Don’t Starve Together; old, instanced MUDs; and numerous other small community games suggest this strategy can be both financially successful and fulfill social design goals. If you want to create larger communities, try limiting yourself to cohorts of 500–1500. There are no other systems larger than these values that are meaningful on a relationship level, and by creating larger populations, you dilute and harm existing social bonds. When creating groups of 500–1500, leverage your instanced groups of 50 and 150. Create a few low-scope systems that allow weak ties between strongly-bonded friend groups. Trade networks and information exchange will be among the highest-value systems to invest in. Games that thrive are almost always ones that satisfy a strong audience motivation. This is no different for social games and social features. Dunbar’s Layers, in particular, give us a structure for understanding the player’s social motivations. You can think of the various relationship layers as a slots in a list. Everyone has space for about 5 intimate friends, 10 best friends, 35 goods friends and 100 casual friends. If those slots are filled with healthy, mutually-beneficial relationships, a person is reasonably happy. Deepen bonds with existing friends. This is done in order to fill inner layers of the friendship network. Meet new people. This is done in order to fill outer layers. Become a member of a group. Often belongingness will be combined with a desire for affiliation. By becoming part of a social group, it becomes substantially easier to both meet new people and quickly deepen friendships. Think of group membership as a bonding multiplier. It is easy to get caught up in group affiliation as an end, by itself, but remember that, ultimately, people join groups not for the sake of the group, but to fill gaps in their primary friend network. Life events are predictive of gaps in a person’s friendship network. As new people show up in a person’s life, there’s less time for activities that require making new friends. Entering a new intimate relationship or marriage. This fills an inner-layer slot. There’s also the inevitable shifting and merging of your two friend groups. Having a child. This also fills an inner-layer slot. All that time spent in parenting groups often shifts friendships from your single friends over to other parents with kids just like you. Getting a new job. This can fill any number of slots in several layers as you form new work relationships. There are also numerous events that thin out a person’s network. Becoming unemployed. You lose work relationships. Retiring. This is similar to becoming unemployed, but often you lose professional associations as well. Breaking-up or divorce. One of the more intense losses of an inner, highly-intimate bond. As well as a weakening of all the shared relationships (closed triadic relationships in your networks). Moving. Shifting many high-intimacy friends into outer layers. Can break existing friendships and free up slots. Research suggests it generally doesn’t destroy intimate family bonds. Kids moving out. When kids go off to college, most parents end up losing key members of their inner circle. Becoming elderly. There’s a slow erosion of existing friend networks as people move or die. Elderly are also are less mobile and thus struggle to meet new people. In particular, there seem to be three major periods in which loneliness spikes: Late 20s, mid 50s and late 80s. During these times one study reported as many as 75% of people report being lonely. These values hold across genders. Providing these individuals with tools for building healthy relationships would be immensely beneficial to society. All of this suggests opportunities for social game design to improve the lives of our players. Games for friends. High-trust games should target those with free time and strong, existing friend networks. The design focus is on bringing those friends into the game. Games that help make friends: Games that deliberately try to convert strangers into better friends should target groups that have gaps in their social network. For example, one demographic might be lonely 50-65 year old men who are seeing an erosion of their social network due to unemployment, kids moving out, and fewer opportunities to find new friends. Make a game that is the modern version of a Masonic Lodge. Both opportunities could be served by the same game, but be sure to sort incoming players based on their needs and direct them into activities that satisfy those identified needs. Key discoveries in social psychology place hard limits on the types of social games we can build. Dunbar’s Layers research shows that players have hard limits on the number of meaningful relationships in their life. These friendship are organized into layers of increasing size and decreasing intimacy. These are the physics that social designers must understand and build into their designs. Many past designs ignored Dunbar’s Layers and naively assumed “more is better.” They ignore friendship formation and assume “it just happens.” They ignore social groups and arbitrarily mash players together. Fewer in-game friendships. A flood of strangers swamp the reciprocation and proximity mechanisms that generate friends. Poor identity, persistence, reciprocity, and consent systems mean these strangers never convert into friends, so there are fewer meaningful relationships in the game. Increased toxicity. Large groups of strangers naturally breed toxic sub-groups. Players engage in violent rejection of out-groups in order to protect their experience and intergroup conflict becomes the cultural norm. Such communities are hard to reform and poison long-term retention. Scope creep. The additional systems necessary to manage large groups of strangers substantially increase the scope of your game. If players have not filled all the slots in their primary friend network, they suffer. And, in response, they are intrinsically motivated to deepen their existing relationships or build relationships with new people. Striving for belongingness is one of the strongest human motivations. They will naturally seek out activities that help them make friends and belong to something bigger than themselves. Increase retention and engagement. Your game becomes the place where people attain their desires. Since you provide immense value, they make the game a key part of their lives. Improve the lives of your players. They’ll experience less depression, better health, and have more robustness in the face of negative life events. Build games for smaller cohorts. The base activities should target small, collaborative groups. Large groups of close friends are rare or, in many cases, mathematically impossible. Cluster players into persistent, high-density cohorts. So they have repeat interactions with the same players. The more reciprocation loops that are completed, the stronger the friendships. Big, empty spaces are not a positive feature. Encourage high-concurrency events or asynchronous activities. Logistics favor players being around to interact with their friends. Having friends playing the same game doesn’t matter if you never see them. Aim for long-term engagement. Build a game where players are engaged for hundreds of hours, so they have enough time to build deeper friendships. It takes at least 50 hours of interactions to form a basic friendship. Attract existing friends, if possible. Existing friends from the strongest foundation for your game community, especially when first launching your game. Put people into safe, guild-like structures and encourage them to bring in their friends. Design for climbing the trust spectrum. When introducing strangers into your game, build low-trust activities that scale into high-trust activities. Start with parallel or single-player gameplay and allow players to opt-in to higher-dependency activities. If players start forming strong friendships in game, support them. Bring those relationships into safe places with tools for enabling consent, support, and disclosure. As ethical game designers, we should strive towards some higher purpose beyond merely extracting money, time, and energy from our players. Building friendships and providing lonely people with human connections are goals worthy of our highest-quality work. If you are working on a multiplayer game, ask yourself how your designs help build social capital with and among your players. If you encounter people who believe that “more is better” when it comes to building social systems, we recommend you send them this report. There’s a new wave of social game design inspired by lessons from social psychology and we are immensely excited to be part of it. Roberts S, Arrow H, Gowlett J, Lehmann J, Dunbar R (2014) Close Social Relationships: An Evolutionary Perspective. In R Dunbar, C Gamble, J Gowlett (Eds. ), Lucy to Language: The Benchmark Papers (pp. 151-180). Oxford: Oxford University Press. Available leisure time. The average American woman spends roughly five hours per day on leisure activities (35 hours per week), while the average American man spends about 5.5 hours per day (38.5 hours per week). Williams, D. (2007). The impact of time online: Social capital and cyberbalkanization. CyberPsychology & Behavior, 10(3), 398–406.